The finger-like alveolar extension in longitudinal view lies along the dorsal surface of the filamentous reticulum from which the cytopharyngeal microtubular ribbons originate. Whiskers of electron dense material bind the finger to the cytostomal cord. 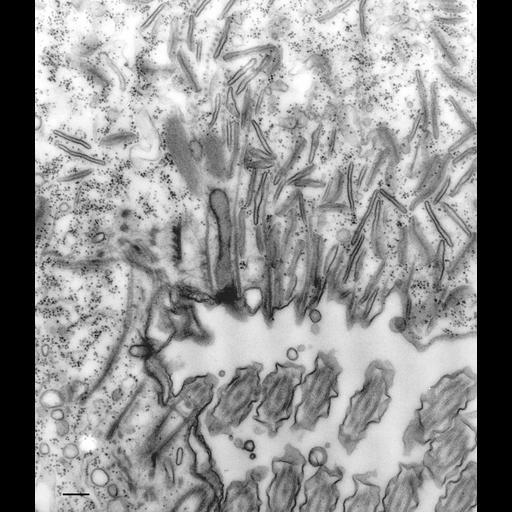 Microtubules arising from the dorsal row of basal bodies of the quadrulus are bent posteriorly when they encounter the filamentous reticulum. TEM taken on 4/6/74 by R. Allen with Hitachi HU11A operating at 75kV. Neg. 15,250X. Bar = 0.25µm.